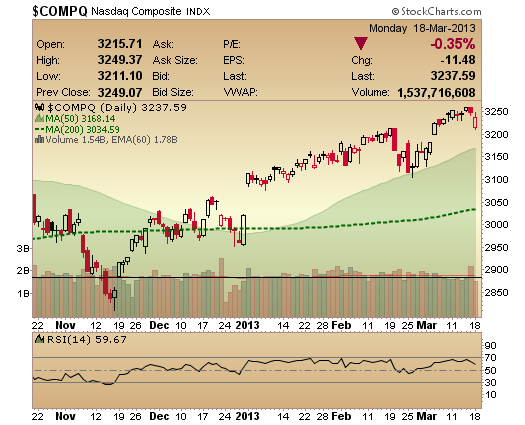 You can either look at today’s move down as the start of something bigger with a lot of downside room to go. Or you can view it as a bump that a car speeding up a hill runs over and the sheer momentum of the vehicle will likely transport the car farther north before eventually turning. Your bias is generally determined by your portfolio unless you are using some sort of unbiased timing signal. Nothing changed with my timing signal so the only way I’m viewing today’s action is a bump in the road until something else changes. Notice how for all the media attention and bearish tweeps coming out of the woodwork we’re still well above the 50day ma. And we’ve recently made a new high that has yet to be tested. Let’s see how the Nasdaq reacts upon testing recent highs before jumping to any foregone conclusions that it’s time to exit longs and start shorting. 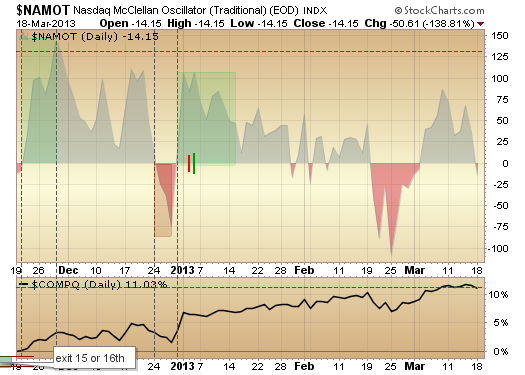 Nasdaq McClellan Oscillator has dipped negative but that in itself means nothing. It can do that as the market continues higher.